Hailed in all our favourite design magazines, Scandinavian interiors and hygge décor has swept the world over with its pared-back style. Shining a spotlight on clever functionality and pleasing aesthetics, this design movement has added an appreciation for craftsmanship and understated elegance in everywhere from city lofts to country cottages. A look inside this ani M bespoke furnishings project is no exception. 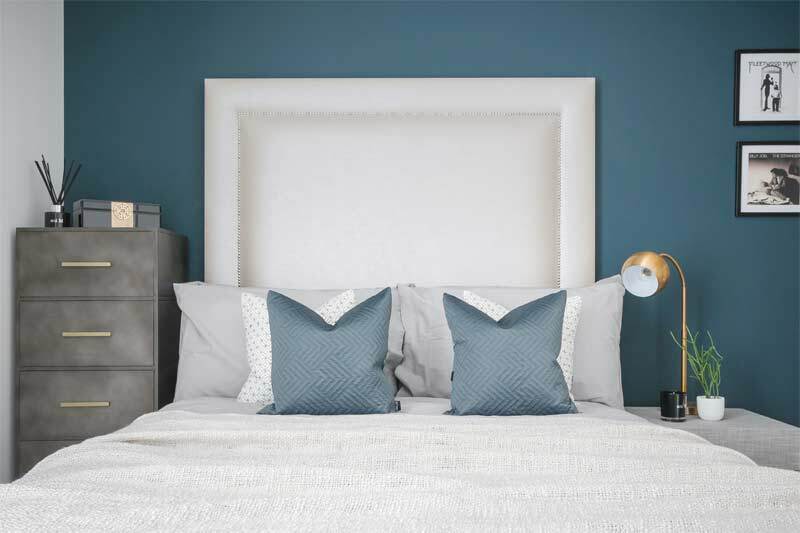 At landmark riverside development Royal Wharf, this modern apartment has been re-imagined with chic Scandinavian style; each room spilling with wonderful character and detail. With an emphasis on simple forms and pretty, pastel hues, this snug setting boasts a beautiful mix of colours, textures and shapes, all brought together to create a visual masterpiece. In the apartment’s living room, dark polished wood is teamed with layers of soft furnishings, intricate ornaments and metallic drapery. The eye is immediately drawn to the room’s contemporary coffee table, with its beautifully clean, geometric lines, as well as the white marble stone clock and gold cube table lamp; all a nod to Scandi design’s effortless aesthetic. The lounge’s gentle grey and beige tones are complemented with the breezy blue of glass vases and patterned cushions, which lend a soothing element to the space. Among this medley of elements resides the spirit of Nordic understatement – maximum style with minimum fuss. Tastefully presented, the dining table is just as much of a visual feast. A sleek grey table sets the scene for white crockery and tall coloured vases, all surrounded by smart high-back dining chairs. This wonderful combination of crisp, modern lines and the quirky, more rustic look of the decorative vases creates an effortlessly sophisticated look. The finished product is a truly multi-functional space to eat, entertain or simply chat the evening away with a glass of wine. 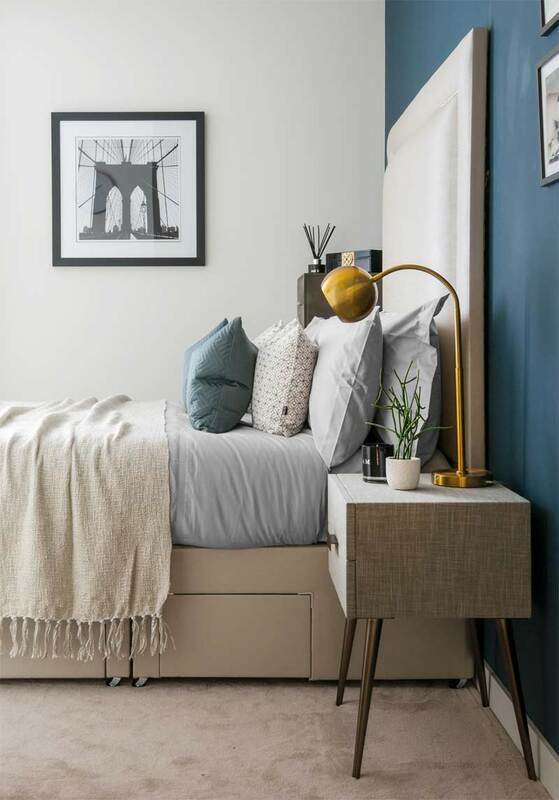 A glorious mix of blues, contrasting textures and modern artisan pieces bring an artistic quality to all of the apartment’s bedrooms. Since the client wanted the home furnished for his 18 years old son who was soon starting university, the team made sure each of the rooms were both relaxing and inspiring, with a mix of furniture, décor, lighting and more to create the perfect study sanctuary. In the first bedroom, a stunning pearl-white headboard shimmers against a Hague blue wall, while layered pillows and gold bedside details lend a characterful, homely touch. Continuing the Scandi theme, a quintessentially mid-century modern bedside table borrows its slim, tapered legs and understated retro details from iconic ’50s and ’60s furniture silhouettes. A metallic globe desk lamp adds to this retro vibe, its gracious curves complementing the table’s streamlined frame. In the second bedroom, whites and greys are interwoven to create a clean and calming look, with pops of colours like lilac and teal green for added accents. The simplicity in design allows for the furniture to captivate, with porcelain white bedside table, shelves and cabinet creating a bright, airy space. Set on slanted legs, a delightfully retro armchair provides extra comfort, while floral details sprinkled around the room lend a fresh, delicate feel. A fully-dressed project, the apartment’s refined luxury, alluring forms and sensory detail come together to create a home that is at once functional and comfortable. You too can create a space that incorporates the simplicity, utility and beauty of Scandinavian interior design; contact our team today, who will be able to incorporate this style to create beautiful and comfortable spaces in your own home.